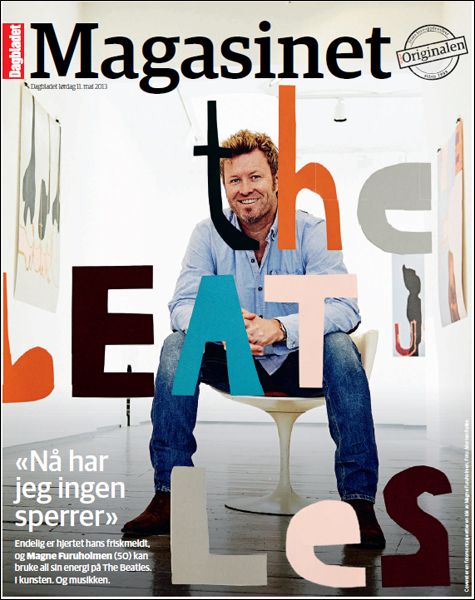 This 6-page interview with Magne was published in the Saturday edition of Dagbladet on May 11, 2013. The interview took place in London on May 2 as Magne prepared for the opening of ‘Norwegian Wood’ at Paul Stolper gallery. The article covers his art, The Beatles, how he balances work and family time, an update on his heart condition, and more. In the article, Magne says that he likes that his art is easily understood. It probably has something to do with my background in pop music, I like things that are immediate, but that have additional dimensions if you bother to take a look. It shouldn’t be the case that people feel inferior when they stand there and look. It becomes sort of like relatively banal or kitschy song lines in brilliant pop songs…it can be songs that you think are cheesy ballads. Then suddenly, something happens in your life that makes the song get a whole new meaning, and for the rest of your life, that song reminds you of that happening or experience. I see that as pop music’s strength and I hope to take a little of that over to my visual production in art. I don’t make art that has to be understood by reading manuals. The article also gives some focus to Magne’s health. Having lived with heart problems for many years, he had an operation last year that has given him a new life at age 50. I’ve lived with heart problems and of course it’s been difficult for periods of time. But, knock on wood, after the operation last year, I’m in great shape. I have to thank the Norwegian health care system for giving me a new life as a 50 year old. The problem now, is of course, if you ask my wife, that now I can work more than ever. Now I have no barriers. See below for a full translation of the article. After 20 years with heart problems and pain, Magne Furuholmen is ready to create art from his biggest heroes, the Beatles. Magne Furuholmen is now going to make music for a film based on Lars Saabye Christensen’s novel “Beatles”. The music will be made in the Beatles’old Abbey Road studios in London, and the film has gotten permission to use original Beatles music. Earlier, Furuholmen composed movie music with Kjetil Bjerkestrand under the name Timbersound. They received TONO’s (a music organization) “Edvard Award” for the music to the TV series “Hotel Oslo” in 1998. He was one of the mentors in the music program “The Voice” on TV2, where his “student” Martin Halla, won. He got his breakthrough as an artist with the exhibit “Kutt” at the Henie-Onstad Art Center in 1995. He presently has an exhibit called “Norwegian Wood” in the prestigious Paul Stolper gallery in London. The price for each picture at this exhibit is 60,000 kroner. Furuholmen has used several techniques through the years including woodcut, glass, sculpture, painting, ceramic, and sound. His artistic background is that he was a student of Kjell Nupen. It’s very busy in London’s labyrinth of streets. The Spring sun is shining, the birds are singing, there are noisy cars, cold beer and bare legs. Behind a white painted door on Museum Street, Magne Furuholmen comes out, with clacking brown boot heels. With a “sixpence” cap over his unruly, curly hair, and a scarf around his neck, he is either sick with a cold or so occupied with his work that he didn’t check the outdoor temperature before he got dressed. He also has a jacket on, it’s not even open. He spreads out colorful letters. They lay helter skelter over a white table at the end of the gallery. On the table now there is “stealth bee”. Then he shuffles the letters around and makes “table sheet”. He moves the letters around and around…”sable teeth”, “beat she let”, “athletes be”, “Beetle hats”. He stops a moment. He rummages around in his pockets, and heads towards the exit door. He lights a cigarette, and covers the flame from the lighter with his hand. He inhales deeply, looks at life on the street outside the gallery. a-ha Mags ponders behind that blue gaze. A few years ago, it was unthinkable that he would be able to stand on a street in London, enjoying a cigarette without being attacked by screaming girls. Now he can stand in peace. It’s a double dose of Beatles for Magne Furuholmen. Presently, he has an exhibit called “Norwegian Wood”, a series of woodcuts inspired by Beatles hits at the Paul Stolper Gallery by Tottenham Court Road, Bloomsbury, near Leicester Square in the middle of London. Also, he is just starting on the film music for the upcoming film version of the Lars Saabye Christensen novel “Beatles”. This time, it started with a letter to Paul McCartney and Yoko Ono. Magne did it as a favor to help his friend, Lars Saabye Christensen. In the letter, he explained how important the Beatles had been to a-ha, and how important it was for the upcoming film to be able to use original material. He rubs some sleep from his eye, sticks a finger under his “sixpence” cap, to itch his curls under his warm hat. There is a touch of silver and gold in his hair sticking out from under the sides of the cap. Restless heart, Flutters, Arhythmia. Pain and discomfort. Magne Furuholmen has lived with heart problems for 20 years. They have been tough years, but now he is OK. After an operation last year, his heart has calmed down considerably. He stretches his arms up in the air, as a victory gesture over his heart problems. He tells how it is to have a problem-causing heart in the body. The pictures hang from big clothespins on simple screws screwed right into the gallery walls. Several of the woodcut pictures are colorful–a screaming orange color reoccurs in several pictures. It functions as a wrong hit between tangents, a cool contrast in harmony. After the opening of the Peter Blake exhibit at Tjuvholmen last year, Magne sat and talked with the man most known for the album design for “Sgt. Pepper’s Lonely Hearts Club Band”. He points and explains, and shows how the letters “P” and “B” are in one of the pictures, the one that symbolizes “Sgt. Pepper’s Lonely Hearts Club Band”. Several of the titles are soundtracks that will be in the movie, otherwise he has picked out titles that he likes the sound of. The exhibit got the name “Norwegian Wood”, naturally enough. Suddenly he is gone. Where did he go? Paul Stolper, the gallery owner, says “I guess he’s gone to the loo”, (bathroom), thinking aloud. He and Magne have a friendship that stretches back many years. In 2011, they opened the gallery “Stolper + Friends” together at Tjuvholmen. As quickly as he disappeared, Magne is back again. He laughs at his own vanity. In the streets outside the gallery, Magne makes a path through the crowds. He crosses the street like the purest Beatles member, and gets a finger gesture from the driver of a white Peugeot car. The artist doesn’t ask permisson before setting out. At home, his wife Heidi (50) and their 2 sons Thomas (23) and Filip (20) have waited patiently, first while he toured with a-ha, and now while he works with different art projects, or performs with Apparatjik. Magne Furuholmen likes that his art is easily understood.